Did you know that the celebration of love on Valentine’s Day dates back to the 14th century when the tradition of courtly love flourished? It seems silly to designate one day to acknowledge those we love when, in a perfect world, we would make time to do it every day. But life gets busy and it’s easy to take our loved ones for granted. Valentine’s Day is a great reminder to go out of your way to tell someone you love how you feel, or even be kind to a stranger. It can be a simple act like letting someone go before you in the grocery store line (which I do whenever someone behind me has just a few items) or paying the toll for a car behind you. I believe these gestures positively impact not only the recipient but also yourself—today and every day! 1. Chairish is a great resource for vintage and modern furniture and accessories, as well as affordable art. This abstract fuchsia painting would be a great counterpoint to a traditionally decorated interior. 2. If I can’t convince one of my clients to use this in one of their rooms, I’m going to have to find a place for it in my house. The pink color and gold hardware make this barn light one of the cutest sconces I’ve come across in a while. 3. Shoppe by Amber Interiors has beautiful accessories by hard-to-find labels. This planter is made by Pop + Scott out of Australia. The pink band brings just the right amount of color. 4. As far as I’m concerned, trays make the world go round. That may be a bit of an exaggeration, but one can never have too many of them. They bring order to everything from a stocked bar, to a bathroom counter to a coffee table. I love the pink on the bottom of this tray. 5. These red- handled scissors are the perfect Valentine’s Day gift for your super-organized friend or co-worker. 6. This kilim pillow is a lovely shade of pink and the texture gives it a nice heft that could stand up to a sea of patterned pillows. 7. I recently bought these for a client and they just might be the perfect coasters. The gold strip dresses them up and makes them right at home in a more formal living room. 8. George Smith has been making beautiful, timeless furniture for almost 250 years. This chair packs a punch, but the classic shape, turned legs and casters temper the color. The subtle ombre at the bottom makes it feel youthful. I would use this in the corner of a girl’s bedroom. 9. I love CB2’s Marta glasses. They come in several colors and sizes and are equally appropriate for every day use or for a cocktail party, and their price tag is hard to beat. 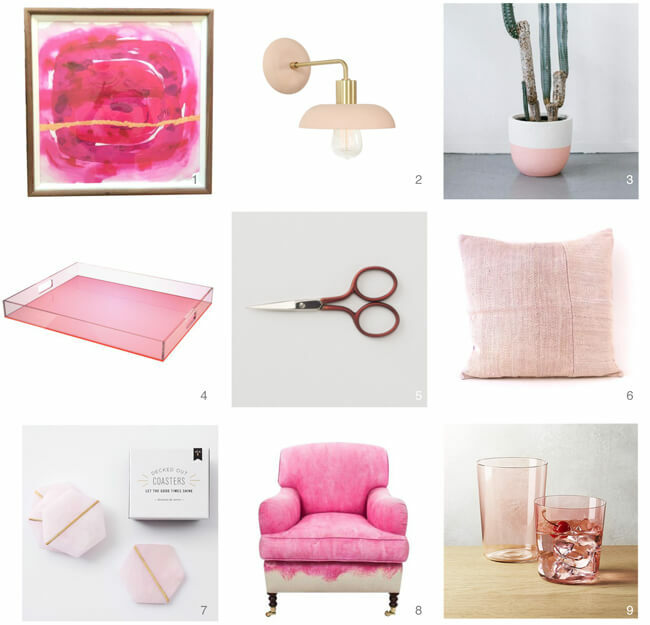 This light pink hue would be perfect on any Valentine’s Day table.